That is the conclusion of the white paper Making Open edX a Thriving Open Source Project by Nate Aune, which was published in May and commissioned by Stanford University’s Office of the Vice Provost for Online Learning. Stanford has been a major contributor to Open edX since its open release in 2013. One might describe the paper as a bit of “tough love” on Stanford’s part, the kind of thing you see when someone you love is not yet living up to their potential. Stanford’s enthusiasm for the open source eLearning platform is clear. Why else would they go to the effort to do a study and generate a dozen recommendations to give the project its best chance of success? We're excited to see this level of commitment from major players. As it turns out, the first recommendation in the paper is to rework that mission statement to better articulate what Open edX can actually contribute to universal education — the platform to serve up educational materials for worldwide consumption. To this end, Stanford produced recommendations in three categories shown in the infographic below: Governance, Technical Improvement, and Community Building. But just as important as the recommendations is the theme that runs through all of them: a shift in thinking must occur from a private in-house model of development to more expansive public collaborative approach. The beauty of open source development is that it taps into the creativity of numerous public contributors who volunteer time and skills to continually evolve a product by fixing bugs and extending capabilities. Coordinating such an undertaking is substantially different than in-house development, which is far more structured and confidential. To be successful, open source development depends upon collaboration by individuals within a community that is rather unruly by comparison. To make it work, visibility is key, not only of the source code itself but of what is being done, needs to be done, and could be done if someone took it on. Open source projects are not endeavors that can be kept close to the chest. Increasing visibility and collaborative focus is at the heart of some of Stanford’s most urgent recommendations. For instance, there has been no public bug tracking and therefore no way for a contributor to know if a bug has been identified, much less whether someone else is addressing it. While open source contributors are giving souls, no one wants to waste their time writing code that will never be used. This has a dampening effect on contributions. By the same token, Stanford noted a certain murkiness around the procedures involved in contributing to Open edX. A recommended Governance fix is to establish clear guidelines of how pull requests are submitted, reviewed, approved and their acceptance communicated. Open edX will also benefit by stepping into the shoes of its outside users. Currently, the edX software is updated weekly with little documentation. For the outside adopter, frequent unnamed releases with no documentation makes tracking the software virtually impossible and downright risky — a state of affairs that can only inhibit the number of new installations. Stanford’s recommendation: move to only 2-4 stable releases per year complete with notes, upgraded scripts, and improved packaging and testing — and with clear version numbering. 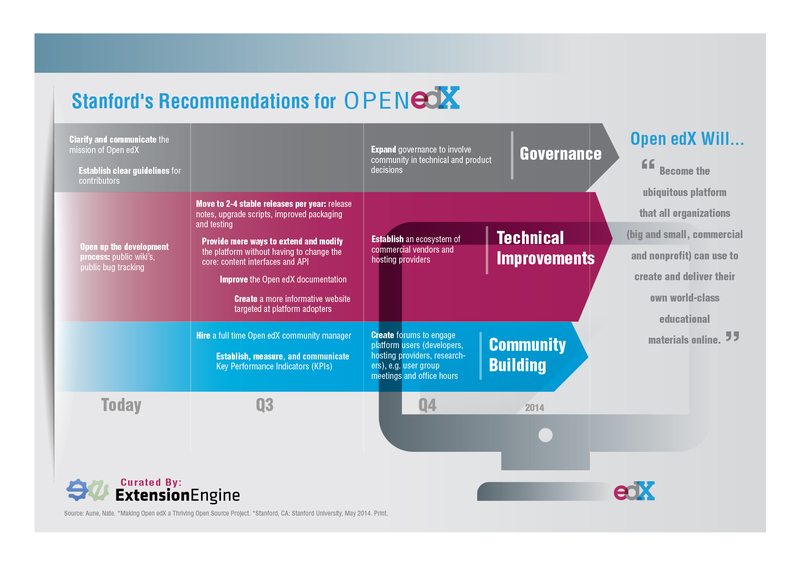 Involving the community in technical and product decisions key to the Open edX roadmap. Hiring a full-time community manager to organize and oversee a variety of community-building activities, from meet ups and forums to book sprints and awards. It’s too early to know what impact the recommendations will have, but just the act of producing the white paper is a measure of Stanford’s faith in the future Open edX and a prime example of the type of community involvement necessary for its ultimate success.